After a long hiatus, Kristin Cavallari is getting back into the reality TV game. The Hills and Laguna Beach alum has a reality TV show of her own in the works. Instead of getting caught up in fake clique drama like the reality TV shows that brought her into the limelight, this show is a lot more personal. PHOTOS: Reality Stars’ Week In Photos – January 25th! Above is a photo of Real Housewives of New Jersey stars Melissa Gorga and Joe Gorga, at the ‘One for the Money’ premiere at the AMC Loews Lincoln Square in New York City on January 24. More photos of Melissa below! Below, Taylor Armstrong attends the ‘One for the Money’ movie premiere! Also at the movie premiere are Kelly Bensimon, Kathy Wakile, and Countess LuAnn, Lisa Vanderpump and Brandi Glanville take a photo together, Kyle Richards steps out with Mauricio, and Camille Grammer does some shopping for a baby! Plus photos of Kim Granatell, Rachel Zoe & more! 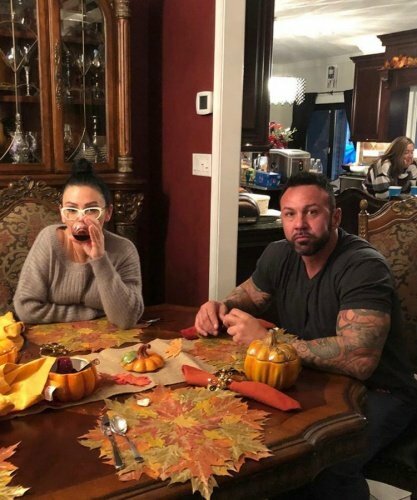 Also, below Kim Kardashian is pictured with Kelly Ripa, Khloe Kardashian is pictured with her father-in-law, plus Renee Graziano, Kendra Wilkinson, JWoww, Draya Michele, Jenelle Evans, & more! Following her shocking elimination on Dancing With The Stars, Kristin Cavallari had some harsh criticism for the ABC hit show! Despite receiving a high score and praises from the judges last Monday, The Hills alum and her partner Mark Ballas were given the boot on Tuesday night. Kristin then went on to state the obvious that DWTS is clearly not a dance competition but more of a popularity contest! Okay perhaps I added in that last part. Kristin however preferred to remain mum when asked about her reconciliation with ex-fiance/NFL quarterback Jay Cutler, stating: “I’m just not talking about it.” Kristin made headlines earlier this year after Jay dumped her out of the blue. The two are now back together. Kristin also appeared on ABC’s Jimmy Kimmel Live! during which she revealed that perhaps not having enough of a “sob story” was part of the reason she was sent packing. The episode called for each celebrity to perform a dance that evoked the most memorable year of their lives. “Maybe I didn’t have a good enough story. It’s hard to compete with memorable years. Mine was I graduated from high school and moved to L.A,” said Kristin. A new episode of DWTS airs tonight on ABC. TELL US – DO YOU AGREE WITH KRISTIN’S COMMENT THAT DWTS IS NOT A DANCE COMPETITION? SHOULD THE JUDGE’S SCORES HOLD MORE WEIGHT?